Polyvance's Mini-Weld Model 7 Airless Plastic Welder is the next generation in plastic welding technology. The temperature control can be taken out of the carrying case for more mobility. It even has a belt clip attached. 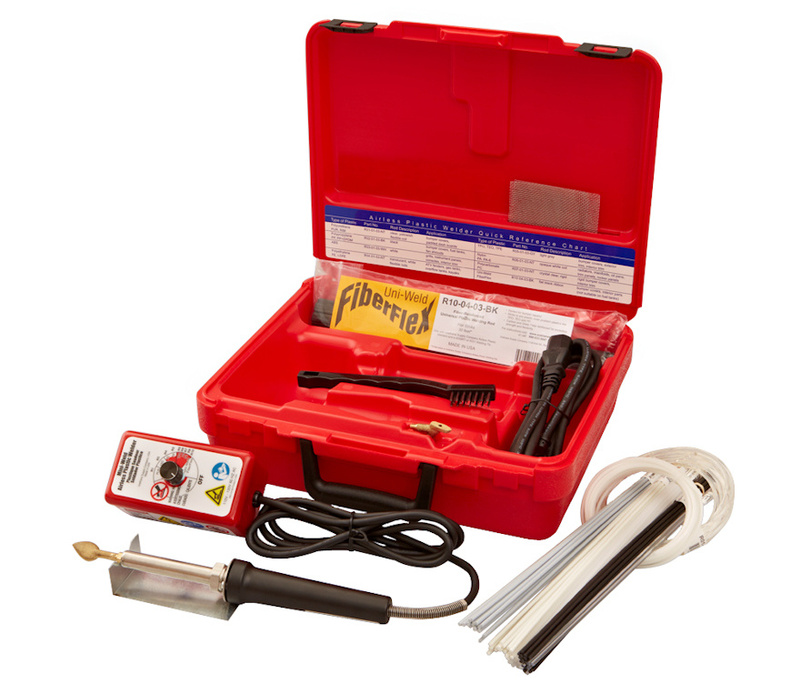 The Mini-Weld Model 7 Airless Plastic Welder is a complete kit that you can use to repair all kinds of plastic. This welder is NOT some stripped down kit. It's a complete, ready-to-use kit that is jam packed with benefits. You will be able to weld high-melting-point plastics (like nylon radiator tanks) quickly and easily with the 200 watt ceramic core element. With seven types of standard welding rod, you will be able to match virtually any type of automotive plastic. Problem plastics like TEO, TPO, and Polypropylene are no problem to repair with the included FiberFlex universal rod. The kit also includes two different, easy-to-swap welder tips for applying all of the included welding rod. Finally, the temperature control box allows you to dial in the perfect temperature for welding whatever type of plastic you are working on. Polyurethane Welding Rod - 1/8th inch (3 mm) diameter.